at the 2013 New Forest Christmas Fair. 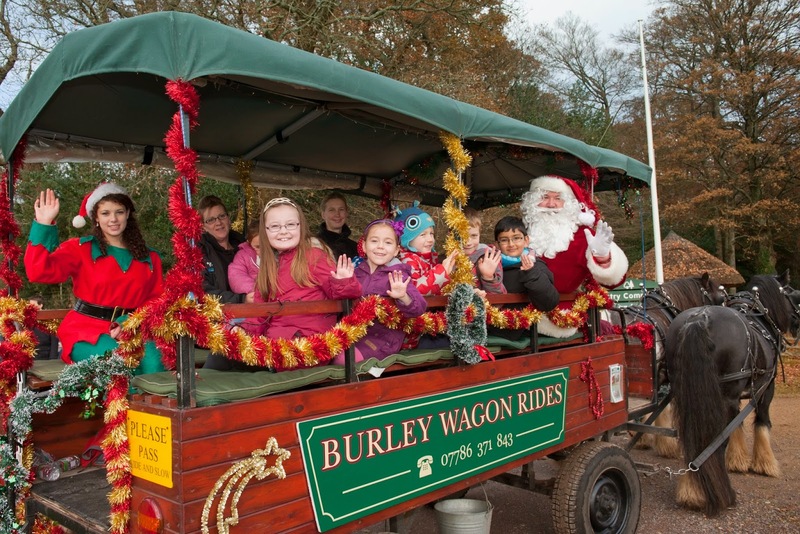 Kick off the festive season with locally produced seasonal gifts, tasty hot food and wagon rides with Santa at the New Forest Christmas Fair. After last year’s successful event, which attracted over 10,000 visitors, the fair is returning to New Park, Brockenhurst on Saturday 6 and Sunday 7 December. The gates are open from 10am until 4pm, with over 100 stalls and food outlets on site as well as a youth choir and Woodfalls brass band playing Christmas tunes. Visitors can purchase their Forestry Commission Christmas tree, enjoy a glass of mulled wine, browse for interesting or unusual locally sourced presents, or sample delicious festive food. Many of the traders are members of the New Forest Marque, a quality assurance scheme supported by the New Forest National Park Authority. The Marque promotes authentic New Forest fare of the highest quality, and encourages people to shop locally. If you are a local trader we would like to hear from you, as there are some pitches still available. Make sure you join the many businesses that make the most of this prime opportunity to sell their goods during the build-up to Christmas. Marque member Catherine Shutler, of Cyril’s Soap Shed, attended the fair last year to sell her goat’s milk soap. Catherine said: ‘The fair is a wonderful event - there are lots of great stalls to buy unique presents and seasonal goodies, and many of the traders are local to the New Forest. Sarah Hunt, New Forest Marque manager and fair co-ordinator, said: ‘We’ve run the fair for two years now, and it’s continuing to go from strength to strength. Last year’s event was hugely popular with visitors and stallholders alike, and the 2014 fair will have even more attractions and stalls for everyone to enjoy. For more information on the fair, or to reserve a trading stall at the event, email jenna.bessant@newforestnpa.gov.uk or phone 01590 646692.